Joss Whedon on the set of "The Avengers"
No one can say for certain what impact the film’s success will have on the industry, but I hope the lesson studios take away is that if you put quality first, big gambles like this will pay off. And “The Avengers” was absolutely a gamble. Four separate franchises and five movies leading up to the big get-together, an insane plan that could have fallen apart at any moment. 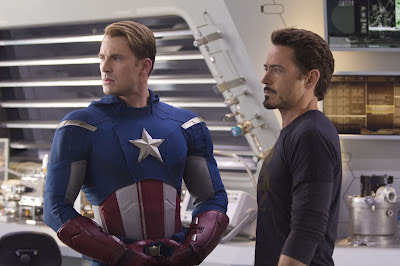 What made “The Avengers” work, of course, is that they hired one of the industry’s best writers and directors, Joss Whedon, who also happens to be a true comic fanatic, and give him free reign to make “The Avengers” movie he wanted and needed to make. 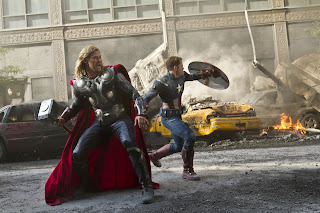 “The Avengers” wouldn’t have excited audiences as a generic studio tentpole; it had to go outside the box and shatter expectations, and Whedon is crazy enough to smash the box and run circles around its carcass (i.e. any scene with the Hulk). That’s what makes “The Avengers” so good, and it’s what getting audiences pumped: it’s like nothing we’ve ever seen before, big and wild and imaginative in the way giant studio blockbusters are rarely, if ever, allowed to be. Audiences like surprises; audiences like something fresh and unexpected. That’s the lesson I see in the film’s success. Viewers are simply going to demand bigger, better quality out of their superhero movies from now on, and I hope that’s what Hollywood takes away from this entire affair. I’ll also admit that as a longtime Whedon loyalist, it’s hugely satisfying to see his popularity explode in such dramatic fashion. Much as I love “Buffy,” “Angel,” “Firefly,” “Serenity,” and “Dr. Horrible,” those are cult properties that never hit the mainstream the way they deserved. I’ve always wanted the world at large to share my love of this mad creative genius, and now that everyone in their mother has seen “The Avengers,” that dream has become a reality. “The Avengers” is, first and foremost, a film with a strong authorial voice, just like any Whedon property, and given how much audiences clearly love that voice, they’re going to want more of it in the future. That gives Whedon license to do whatever he wants for the rest of his career, because no studio is going to say ‘no’ to the guy who turned one of Hollywood’s biggest gambles into a history-making success story. 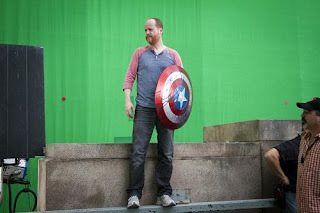 We’re going to see more of Whedon in the future than we ever have before, and that, more than anything else, is why I’m celebrating the ridiculous amounts of money “The Avengers” has pulled in. It will be interesting to see how “The Avengers” dominates the box-office over the summer, because there’s really nothing directly competing with it until “The Amazing Spider-Man” in July. And the only film that poses a legitimate threat to its box-office status, “The Dark Knight Rises,” doesn’t hit screens until July 20th. It will be interesting to see which film does better. I personally believe “Avengers” will hold onto most of its records; much as audiences flocked to “The Dark Knight” in 2008, that film is dark, challenging, and alienating to some casual viewers in ways “The Avengers” is not, and “Rises” looks to be going in an even bleaker direction. It will be big, no doubt about it, but probably not $200 million opening weekend big. After all, with the amount of money “The Avengers” has already raked in, should we start speculating on whether or not it can outgross “Avatar” for the title of biggest movie of all time? That’s a lofty goal, yes, but “Avatar” had earned much less at this point in its run, and wasn’t quite as well received by critics and viewers. $1 billion worldwide is guaranteed. $2 billion should probably be expected. Can it get all the way to the $2.8 billion it would need to break the record? Only time will tell, but if “Avengers” gets there, don’t say I didn’t warn you. This article will be updated with confirmed box-office numbers after the Actuals are released on Monday.